Quick overview This valuable text offers a range of practical, person centred and evidence based approaches to tackling challenges faced by professionals working with people with learning disabilities. This valuable text offers a range of practical, person centred and evidence based approaches to tackling challenges faced by professionals working with people with learning disabilities. It helps the reader to analyze issues relating to person centred practice and citizenship and considers the implications of this key government initiative for health and social care professionals. The authors aim to support professionals in working through this changing agenda, whilst identifying the interface between their own professional practice and person centred approaches to working with people who have a learning disability. The book includes well referenced practical approaches to the subject area, alongside creative and innovative thinking.In addition, the book also: explores the historical context of learning disability services and how this has contributed to the development of person centred services; introduces a range of practical person centred thinking tools that can be readily used within professional practice; contains a model to inform the delivery and integration of person centred practice within professional practice; considers the contribution of a range of different professional roles to the person centred and self directed support approach; and, evaluates the relevance of person centred thinking and planning to people from different cultural backgrounds and those undergoing the transition from adolescence to adulthood. 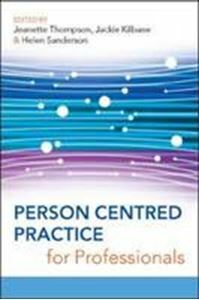 "Person Centred Practice for Professionals" is key reading for students, academics and professionals working or training to work with people with learning disabilities.